I recently received an invitation from RMIT inviting me to attend an event hosted by the Vice-Chancellor and President, Professor Margaret Gardener AO. The event is to showcase the impact on philanthropy at RMIT. 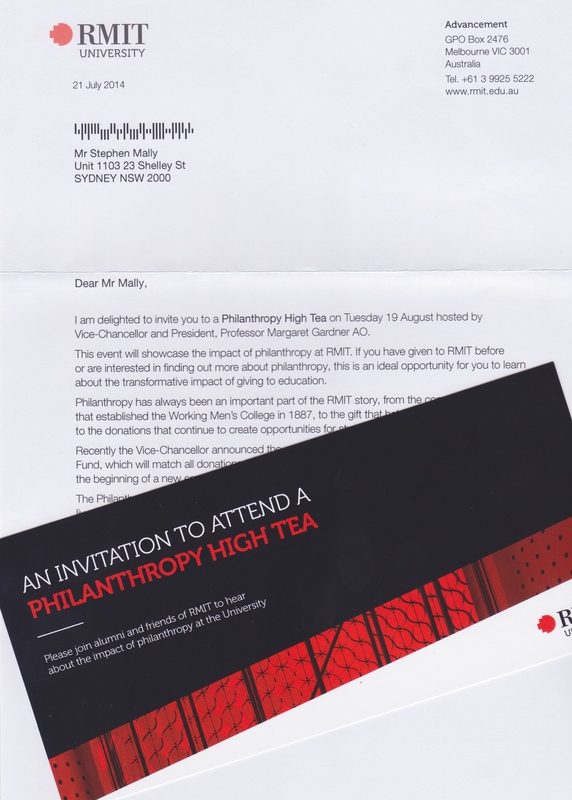 The event appears to be open to donors and prospects alike because the letter attached to the invite says “if you have given to RMIT before or are interested in find out more about philanthropy, this is an ideal opportunity for your to learn about the transformative impact of giving to education”. Organisations often appear to have their hand in our pocket and do not take enough time to share the impact giving has had on their overall organisation. Those of you who know me know that I am an aggressive American-trained fundraiser who never hesitates to make an ask. But, it is nice to see organisations valuing donors enough to educate them about their giving! I love the track RMIT appear to be on and applaud them for events such as this one. Donor care events not only recognise the support donors have provided, but they also help to reinforce and, sometimes create, a culture of philanthropy. I encourage you to use RMIT as a model to create one for your own organisation.